There are four explanations, we humans often tell ourselves over and over again, when it comes to what is preventing us from achieving our goals. 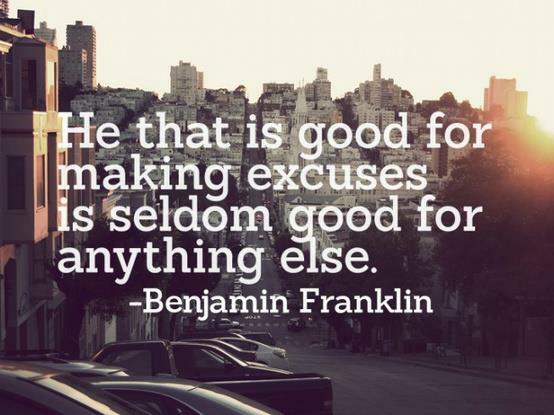 We call them surface excuses, because immediately below them are deeper reasons why we fail to act. These four excuses are just a few, we as humans serves up because they are easy and do not require of us that we really take responsibility and act. Through mentoring, it is possible to get behind the defense mechanisms and act on what really prevents us, rather than focusing on the excuses that immediately seem accessible and reliable. If you truly believe that you do not have time to work to achieve your goal, you must ask yourself if it is worth getting what you want. If you experience time as a problem, you know that it is because you do not prioritize your goals high enough. If you think that money can prevent you from achieving what you really want, so the goal is maybe not attractive enough. What’s important in life is that we each find our purpose – that is what really matters to YOU​​, what you’re really passionate about, what truly gives meaning and quality of life for you. If money becomes a goal in itself, life can easily become meaningless. As humans, we also have many other needs that must be met before we feel happy inside. So if you continue to use your economy as the reason for not achieving your goals, it might be a good idea to work on this position possibly with your mentor. Here it is important to realize that this is merely a belief, and that limiting beliefs can be changed in the same way as they were created, namely yourself. None of those we know who have experienced success, had jurisdiction, since they started. Competencies when they first get down the road, as they have received the necessary training. If you do not have the skills required to work in the field, it has set itself the goal, then I have an education, go on courses, training and thereby improve his skills and competencies. It makes no sense to declare themselves unfit from the start. “I do not have the right network, I do not live in the right place, I do not have the right education” etc.. Etc.. Indicates that it is time to realize that resources will emerge as side benefits, as long as you begins to act. If all those who have achieved the goals they have set in their lives, should have waited until they had the resources, most never be taken off.